Possibly European in origin, but current thought is that it may be native to Canada and has spread south from there. It now is found throughout much of the U.S. and southern Canada as well as all of Europe. Five species of these native spiders occur in North America, being found in all states and in southern Canada. Other species may be found worldwide. The actual origin of this species is uncertain, as it was first discovered in South America, but believed to have originated in Africa. It was found in Florida in the mid-20th century and remained restricted to that state until around 2000 when it began to be found in other states from Texas to South Carolina and in 2003 showed up in southern California. Since that time it has spread rapidly throughout southern California and is thought to even be displacing the black widows there. Several dozen species of Pholcids are native to North America, with the three species listed above the most common to be found in and on structures. This species is native to much of South America, but commonly hitchhikes on exported materials. It has been found in several Central America countries, in Finland, and in scattered states in the U.S., including California, Florida, Massachusetts, and Kansas. It does not appear currently to be a breeding resident in North America. This is a native species in the southwest U.S. This species currently is believed to be native to Europe but was first discovered in North America in 1929, reaching Seattle in 1960. These are primarily native species in North America. 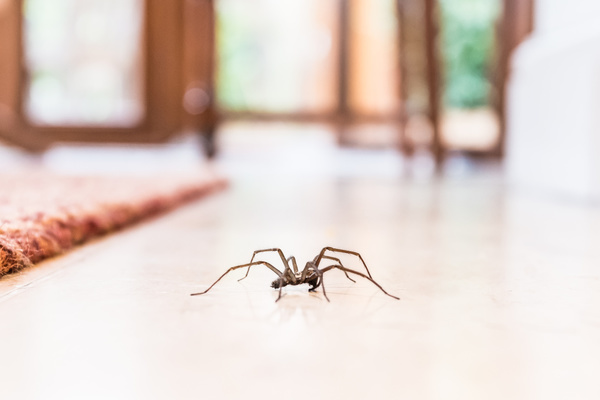 Like the Domestic house spider this species was believed to be native to Europe, but new evidence suggests that it has long been a native of western Canada and now has moved into the Pacific Northwest of the U.S. as well, where it is common in and around homes. It appears to be moving eastward and now can be found in Colorado, Montana, and Wyoming and west to the Pacific Coast of Oregon, Washington, and British Columbia. Native to North America, and found throughout the United States. These likely originated in Asia, considering the abundance of species in this genus in that continent. From 30 to 40 species of these huge spiders are found in North America, with the majority of them found in the southwestern states of the U.S. and south into Latin America. This cosmopolitan species originated in Europe, but now is common throughout the U.S. and southern Canada. Many species of spiders in this large family are native to North America. C. inclusum is native to North America and found throughout the U.S. C. mildei is introduced from Europe and occupies much of the Northeast U.S., as of 1978, and likely has expanded its range considerably since that time.